I love Poppies. I’ve always loved orange -red Poppies. I guess it comes from growing up in Calif. where the state flower is a Poppy. 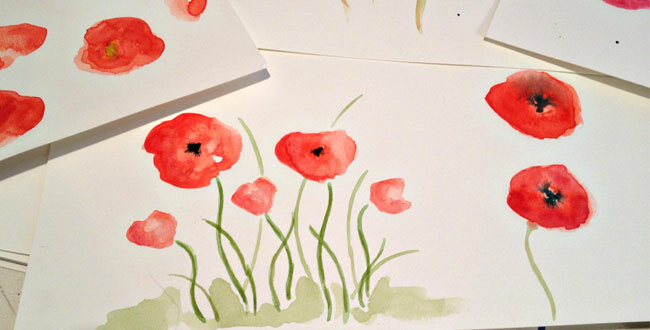 Whatever the reason I’ve always been a fan….especially of watercolor Poppies. So, I’ve decided to learn how to paint them-my way. Everyone has a different style of painting flowers, or anything, and my goal is to find my Poppy voice…haha, funny! I want mine to be simple, pretty and subtle (with a pinch of bold). 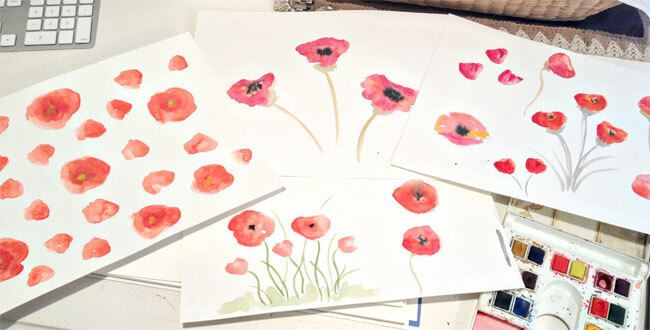 My Goal: Learn ‘how’ to paint poppies-my way, in 3 WEEKS…crazy, I know, but I like to learn things fast. I’ll share what I’ve been working on the next 3 Wednesdays. Hopefully, by the end of the month I’ll have a poppy that will reflect my style and be beautiful too. Beautiful! Can’t wait to see what you come up with! What an awesome goal – I love poppies, too. I think the black in the center is key to making them look realistic. And poppies too, I try to make them overgrow my front garden. Thanks for nice words on my blog! Your so sweet Aga! Thank you! Thank you Anne! I love red poppies also! Totally gorgeous..I love poppies..yours are radiant, poetic and uplifting..such a wonderful color-rush! Beautiful! Thank you Victoria! Poppies are a wonderful flower…very uplifting to me. I love poppies too – these are really lovely!! Poppies are such a good subject for painting. They have such happy faces and that red is just killer. Nicely done. Beautiful poppies, Kristin. Looks like you are already an expert at poppy painting to me. You’re so kind to say that! Thank you so much! your poppies are beautiful – looking forward to see what happens with them! You have a lovely blog Kristin! I just became a new follower! Poppy lover here too! Go for it Kristin! These remind me of Vera sheets I used to have! Lovely work. Beautiful poppies! Love your goal too! Keep it up! Doing POPPIES your way…WORKS! They are great to me. I am new to watercolor. I would love to know how to paint poppies the way you do. Do you have a video with Part 1 thru 4?